Today's project was a long way in the making. I've had these adorable photos of my little one for awhile now, just waiting for the perfect papers to mix them with. Although they are not Valentine photographs, the "lovely" pinks, reds, black and creams of the Lovely Collection are perfect. I loved adding all of the different Petaloo flowers throughout the layout. I started with a full sheet of Amour, then layered Dainty, Valentine and Be Mine, using the Kiwi Lane Designs templates in Paisley Place to showcase all of the various papers. The photos were matted using the 6x6 pad from the Paper Crafting Assortment. I then added Petaloo's wonderful flowers from their Spring Darjeeling collection (Mini Daisies, Dahlias, and Mini Pearl Daisies), along with some small embellishments from the Paper Crafting Assortment. I love all of the little die cuts in the set. The little lock sticker is a perfect addition, peeking out from behind the photo corner. I die cut the title using my Silhouette and both the pattern and the reverse of the Keynote paper. It needed something more however, so I used the Picolla Cool-Set Enameling Gel in Napthol Red. The Enameling Gel was a perfect addition, as it gave shine and dimension to the heart. Lastly, I added another die cut from the Paper Crafting Assortment, and another Mini Pearl Daisy. It was really fun to play with flowers in a layout. All of the little details really made this a special project that I know that I will cherish forever. I can never get enough flowers. They seem to be a staple in my scrappy stash, so I was so excited to be able to use Petaloo on my Lovely project. Guiseppa here, to share with you a shadow box frame I made using Lovey and Petaloo flowers. I made my frame from a Silhouette cut, so it is all cardstock...kind of cool huh? I used some Lovely to makes some additional flowers and to line the inside of the box. I also used the Lovely Element Stickers for added establishments next to the flowers. I added a little bit of pink ribbon from May Arts. The message inside the box is a from my sweet hubby Sam. He wrote some things about me that he loved and gave it to me one day. I thought it was so sweet and I needed to find a way to display this cute way of him showing his affection for me. Just an idea here, but maybe you could break out a bit of Lovely and make a special Valentine's Day gift for that special someone in your life. Love the projects. Thanks so much for the ideas! FAntastic projects and such great use of the flowers! Very inspiring! Beautiful DT projects today! I love all the different patterns and designs in Lovely! especially LOVE the shadow box---what a great gift for a spouse! Such beautiful projects! I am amazed at the paper frame! Very curious about the enameling gel used to make the heart on the first project, I had never heard of it before. Wow!!!! 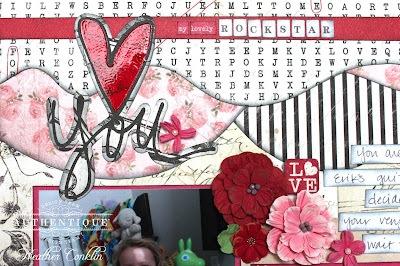 Amazing Layout, love the enameled heart!!!! Ladies , you all did such a beautiful job. All of these projects are amazing . I love the papers and flowers together in so many different ways . Bravo. !! Awesome layout and lovely frame! Beautifully done! Lovely projects! I'm in serious like with that gel-enamel heart! Both are very pretty projects. Such a beautiful partnership..I loved both projects! Have a wonderful day! Lovely projects ladies and Happy Hump Day!! Thanks for the chance to win such an awesome prize package! Beautiful projects! Especially loving that layout, the embellishments really make it shine! Beautiful layout and framed project! Gorgeous papers and embellishments! Love love LOVE these projects! I know I will lift Heather's page! Another day of gorgeous projects! LOve the pattern mix on the layout and all of the gorgeous layers! And that box is just so romantic! Love Love Love! Flowers do add a lot of dimension to projects. Love the frame. The layout is wonderful with all of the layering. Great projects made with fabulous paper and flowers. Amazing layout Heather! 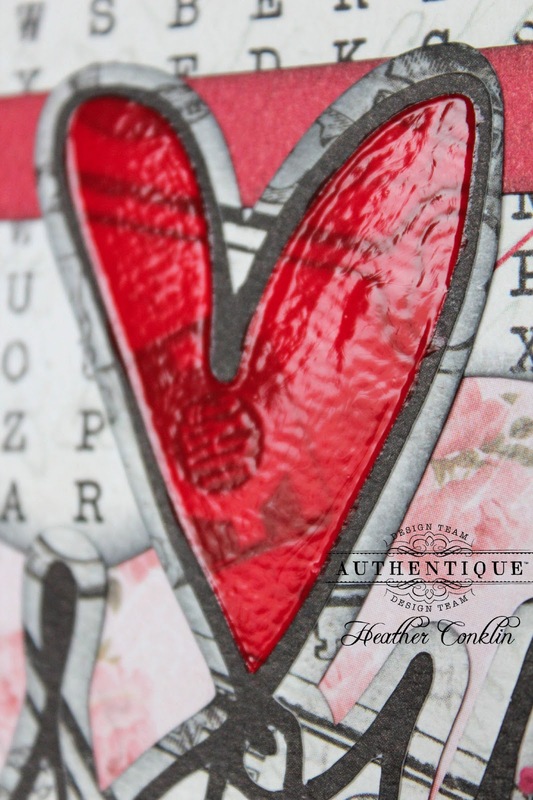 I LOVE your wavy borders and the glossy heart you made with the enameling gel is totally fabulous. I'm going to have to pick up some of that! Guiseppa your frame is so pretty! I love the simple elegance. The colors are amazing. I love your paper patterns, and the flowers are yummy! 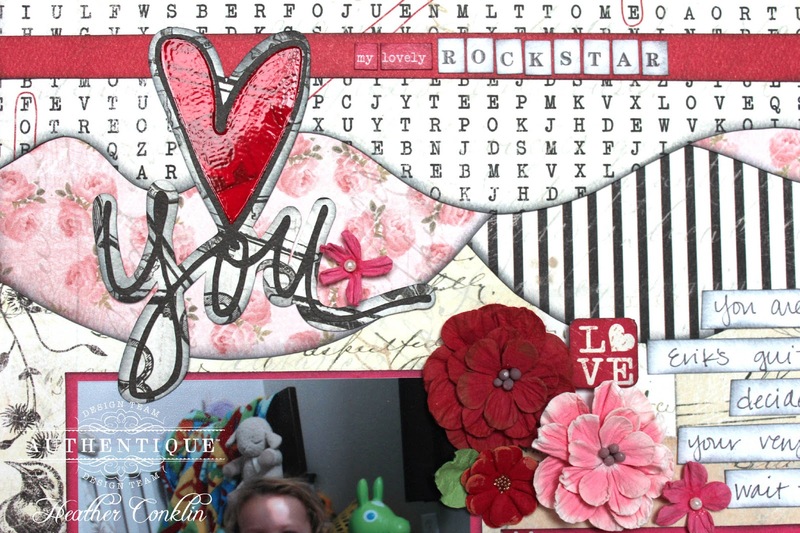 Fantastic job on the blog hop ladies. All the creations are so beautifully put together! I love Heather's use of a Valentine paper on non Valentine pictures. I also love the way she took 2 papers and made them look like a ribbon twisting to show the front and back sides. Very clever! Guiseppa; I love the fact that you used a note from your husband and made it into a daily reminder of his love for you. While I have no 'love notes' I do have several of the little cards that come with flowers, signed by my husband. They've been sitting in a drawer and now you've given me an idea of what I can do with them. I love your use of flowers on the frame. Both projects were gorgeous! Super pretty layouts, love the flowers, but they're not overpowering like some layouts I've seen. So gorgeous! 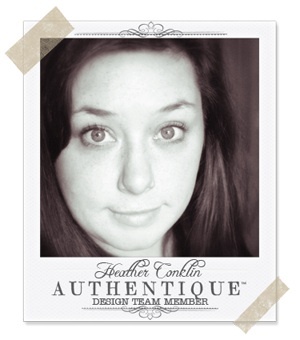 Heather--your layout is stunning, and I love the enameling gel--the perfect touch!! Very pretty projects! Im loving that Enameling gel. The flowers are the perfect match for all the papers! Love the heart and waves on the LO! Pretty layout, love the glossy heart! 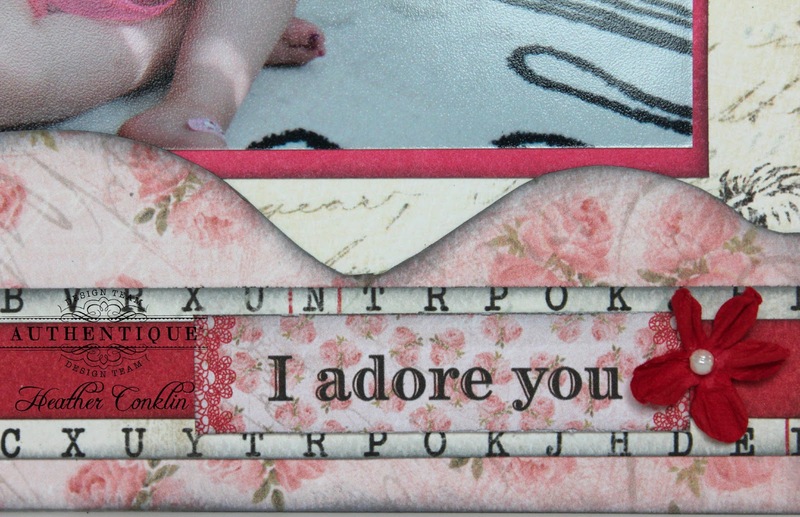 Great idea to frame those lovely words and make it look so pretty! for the projects are very pretty. I love the layout. The red enameled heart really does pull it all together perfectly. I also love your design of the layout sketch...really different and fun. Love the shadow box ! We just got invited to a wedding but we can't attend, I think I'll make a shadow box of the invitation and send that along with our gift. LOVE the projects today! (As usual.) LOVIN' the LOVELY collection! 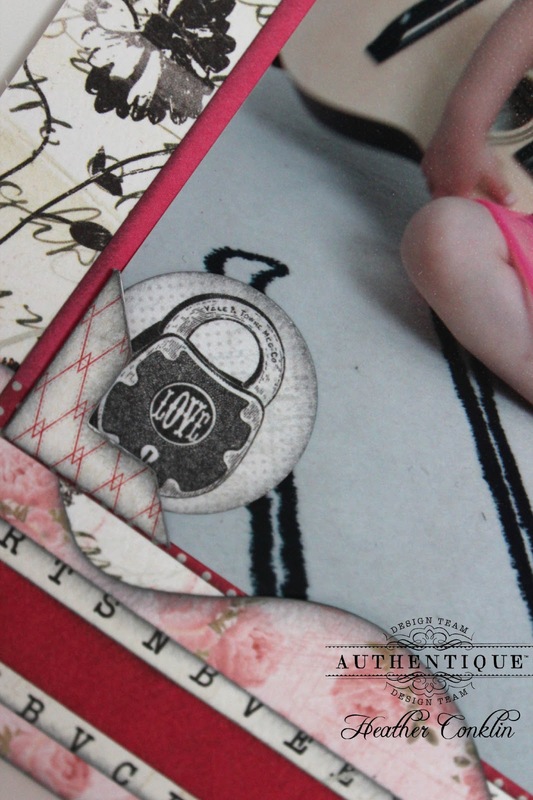 Wonderful creations showing the awesome ways Authentique and Petaloo can work so well together. The "Rockstar" layout was so cute. I always loved watching my son play with his toys when he was little. Such a wonderful time in their lives. Such wonderful projects and inspiration!! love the layout, great detail with the enamel, wonderful layering and movement. the shadobox frame is lovely, like the touches of flowers and pins, thanks for sharing and chance to win. Wow, even more gorgeous pink projects! I just love them all! What a lovely page! Love the wavy edges. And that frame.... isn't it just gorgeous!!! Love the products you both used. I love the layout! It is perfect with the pictures! I also like the shadow box, you must have a loving husband ! Beautiful, I am enjoying all the inspiration, thanks!! Love you layout--what a sweetie you have. Beautiful verse for your shadow box as well. Outstanding projects again today! I love Authentique and Petaloo! it's more beautiful than I have ever seen! These projects are fabulous! Gorgeous papers and beautiful flowers, what more can we need? Love this week. Love your projects, always beautiful!!! The layout is amazing, love all the embelliments. These projects are really making me feel inspired! Can't wait for the weekend so I can have some time to scrap! Lovely projects! Oh and I really like the flowers on the shadow box project. They are so pretty! The layout is super cute! The flowers really add to the page. Beautiful projects. I love the layout. 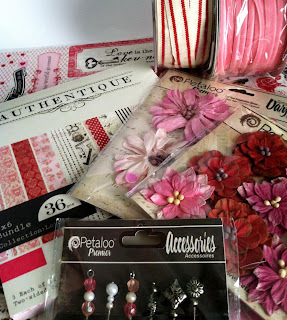 Great projects and the shadow box is great- Love petaloo flowers mixed with Authentiqe. Great combo. I'm loving all the pink & red. The sweet little guitar player layout...rocks! That is a really great layout. Very nice how the paper and flowers came together. What a wonderful way to display the note from your hubby, it looks very nice. what a nice bunch of projects. thank you for sharing. For years I was an anti-flower girl, what with having only boys in my life. Enter my daughter, and now I really, REALLY like flowers on my layouts---can't get enough!! LOVE these flowers! I just LOVE these projects ... and the giveaway, too! I have never heard of the enamaling gel used for the heart on the first layout. Super fun and something I will look for. I love how I can learn new things just by stopping by for inspiration. 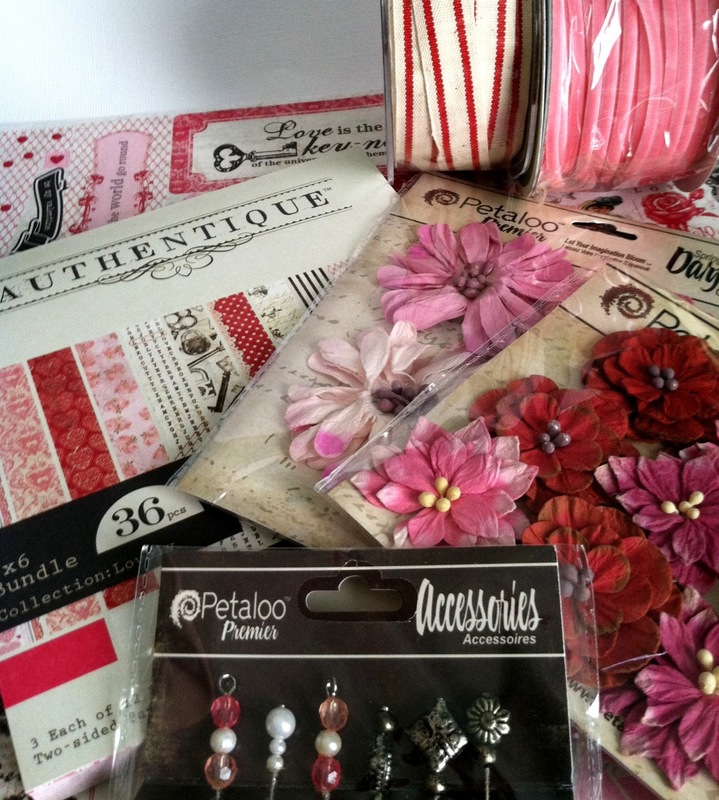 Gorgeous use of your products and Petaloo's. So gorgeous! I love the heart with enamelling! So impressed with each of the projects, but must admit that I am most impressed with Guiseppa's husband! What a sweetie! Lovely layout--I like the shiny heart and wonderful shadowbox. 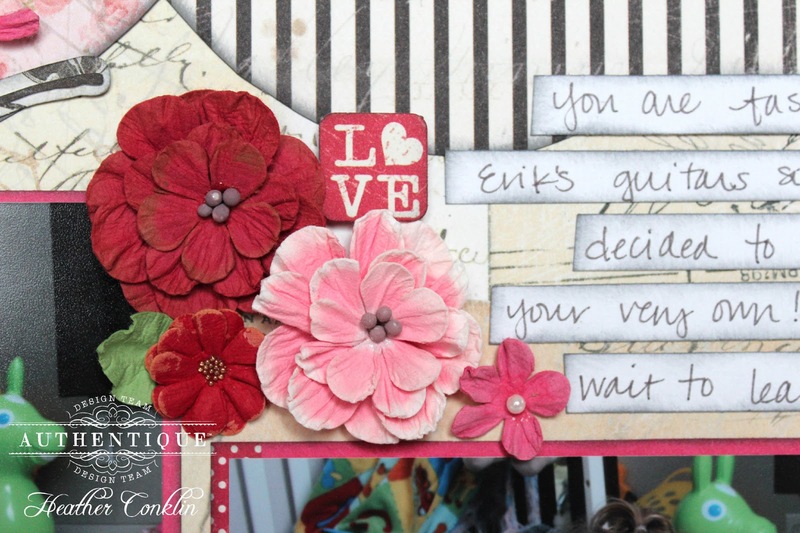 Gorgeous projects today-love the layout especially! Love the paper and the paper treatment on the first layout! And the frame is beautiful, love the addition of the flowers! Thanks for sharing. 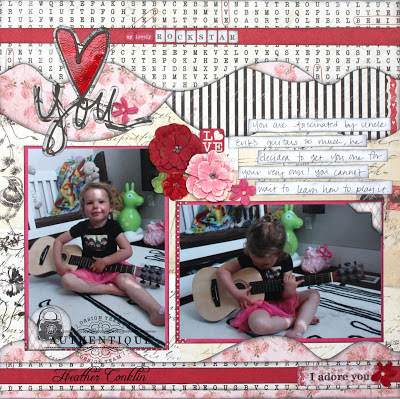 Heather- love, love, love the use of the Kiwi Lane templates. I also love the heart. I also love the use of flowers on the frame. It adds so much to it! I love all the different pattern papers on the layout! It all works very well together and it doesnt look busy! Awesome projects today! Thanks for the inspiration. So beautiful! Makes me want to run out and get some of those flowers, but I can't because the stores are all closed right now! I just love the papers and your projects. Thanks for the inspiration & ideas! Absolutely stunning, Heather! Love how you used all the free-form curved edges. Just wonderful! The flowers really create such wonderful texture and add fabulous color to both projects! Thanks so much for sharing these lovely projects!